The section of track between Westfield and Wiri is one of the most heavily used in the entire country. On top of serving both the Southern and Eastern lines, it is also sees more rail freight pass over it than any other stretch of track in NZ. It’s so busy that Kiwirail have declared “the current twin track configuration has reached the maximum operational capacity”“. That lack of capacity is resulting in delays to both passengers and freight. 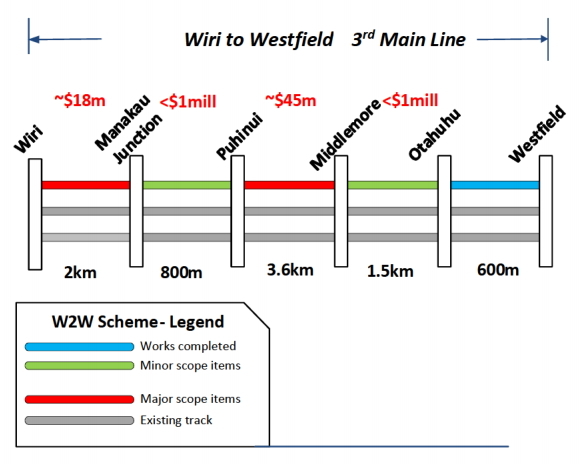 It’s long been known that the best solution to the issue issues between Westfield and Wiri is to build a third track to improve capacity. Yet bizarrely, the project still hasn’t been funded. We wanted to see just how strongly the project stacked up and so a few months ago Harriet asked for a copy of the business case through an Official Information Act request. Things went to another level after it hit the news that the Transport Minister’s office tried to block Kiwirail from releasing the document. Kiwirail subsequently released it but only after first heavily redacting much of the key information in the report, although they left enough we could ascertain the project stacked up well. This week, likely in response to a review of the situation by the Chief Ombudsman, Kiwirail released the full, almost fully un-redacted business case. Reading through the document, the reason for the Ministers office to want to hide the document becomes clear. That’s because it’s likely the only thing worse than realising you need to be build one extra rail line is being told you need to build two of them. In this case that means both a third and fourth line on this section of track. All mention of a fourth track had been previously been redacted, leading to much speculation as to what was hidden in the document. 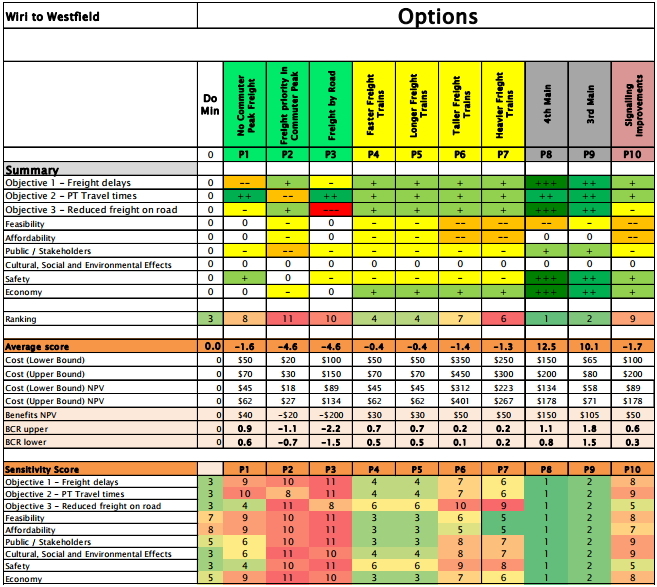 The report lays out a multi criteria analysis to look at the differences between each of the options proposed. There are some definite issues with the MCA, such as rating the affordability of both the third and fourth mains the same, but as you can see, in it the 4th main comes out as the strongest across almost all metrics. Unlike the third main, the fourth main would be built on the eastern side of the existing tracks. Of course, it’s not going to easy to get a fourth main built. It would likely mean that many bridges and potentially stations along the route would need to be rebuilt. As such, the biggest argument against the fourth main is really the cost, with the case suggesting it could be up to $200 million. Despite getting the best ranking, the report shy’s away from recommending the fourth main be built by saying it would “create capacity in advance of demand”. Given Auckland’s history of only building infrastructure too little too late, why building the fourth main in advance is perceived by our agencies as such a bad thing isn’t clear. However, given it’s clear we’ll need it some way, it is noted that “The 4th Main will be almost certainly be required in the medium to long term horizon“. As such, it suggests that perhaps some parts to support a 4th main could be built at the same time. However, it is noted that building the 3rd Main and 4th Main (or some component parts) together could result in cost synergies and as a minimum it would be prudent to ensure any land purchases made for the 3rd Main also take account of the 4th Main too. If the costs listed above are to be believed I do wonder if we should just bite the bullet and do both mains at the same time. After all, $200 million is a medium sized motorway project these days and this is something that we’re definitely going to need – and given recent history, we’ll need it much sooner than the transport models suggest. It could also give us opportunities to try out other service patterns and/or things such as intercity trains. Track works between Wiri and Manukau Junction. While this diagram shows where the investment is going, with the majority into the Middlemore to Puhiniu section. It’s good to finally have the full document but it should never have been redacted in the first place. Further, if the models are already saying we’ll be needing the extra capacity of a fourth main in 10-15 years then we might as well build it now. That is the real issue we know that the models constantly understate growth. The other issue is the fourth main has value assisting capacity in this section but its true primary benefits sit outside the scope of this report and thus are not fully counted. What the fourth main does is it addresses the other major constraint (Mixed constraint of course heaps of passenger only constraints) on the Auckland network which is Westfield Junction. The fourth main with some sections a third main (A third main not the “Third Main” in this case is a third track on the approach to Westfield junction from the Eastern Line which joins into what would be the fourth main after the junction) allows freight services to bypass the congested Westfield junction. This means reasonably free easy freight paths between Port of Auckland/Local Shunts to Wiri Inland Port as well as to the regional rail network. It also helps with any Port of Auckland to Westfield freight movements. This would significantly increase freight capacity to and from the Port. Meaning much less trucks needed in the City. Also by the freight movements being taken off Westfield junction this really helps passenger services. As well as making intercity/express services much easier/faster/feasible. Thanks for your widey read article yesterday, Ben. Excellent comparison of BCR. You are welcome Heidi and my thanks to Harriet for the OIA work in return. Yes thanks to Harriet for your hard work and for putting the OIA on fyi so everyone can read it. Thanks Matt for the post, too. I was looking forward to it. I’m on your side, as I would be scared to be against you. So this 4th main is on east side of existing tracks and will run through that east most unused new platform at Otahuhu station? This business case only covers the 4th from Westfied junction and does not include any of the eastern line 3rd that will connect to the 4th main? Will that be a seperate project for the future, although essential for fully utilising the 4th main? I wouldn’t be surprised if a deal was done with the Ombudsman where if he said there was no real ministerial interference then the almost un-redacted report could be released. Those are the kind of back door face saving deals that are done all the time. Especially when the ombudsman has no real power other than to publish hiss findings. “create capacity in advance of demand” – that sounds like a definition of good planning. Only if you have an unlimited amount of money… I would say building something that we don’t need today at the expense of not building something we do need today is very poor planning. London’s sewers were built 8 times larger than required – now 150 years later they are beginning to need replacing. Robert Stevenson built bridges over and under his railways lines that are still in use by modern heavy vehicles whereas in NZ every earthquake destroys the new buildings – the old buildings shake and lose brickwork but seem less dangerous. Auckland’s Harbour bridge was built with piers capable of handling 8 lanes not the 4 lanes that were originally built. I’d say over-engineering is a wise long term investment. Put the 3rd and 4th main track now – it will save money in the long run. I agree with everything else but this statement is simply not true – ‘in NZ every earthquake destroys the new buildings – the old buildings shake and lose brickwork but seem less dangerous’. It ignores the large proportion of new buildings that came out unscathed from recent earthquakes and the location of the new buildings that suffered damage. Apologies. I suspect earthquakes destroy both old and new but the new buildings are bigger so their demolition is highlighted on TV and in the press. In fact I recall reading about well designed new buildings surviving but of course collapse is more newsworthy. Make that ‘some of the new buildings’ and yes that Cathedral was not new even if anything post the black death (1353) seems avant garde to me. Still puzzled that nobody is in prison for the incompetence resulting in the CTV disaster. Yes, the CTV building was a tragic anomaly, in that it was not built to the standards of the day (1980s). I believe the police are revealing their findings soon. The PGG building was built to the standards of it’s day (the 1960s) but tragically they were not sufficient for the size of the event and the location of the building. What this shows with tall buildings is that it only takes a couple to fail and the consequences are terrible. Anyway I’ve digressed from the topic a bit! The waterview tunnels are a prime example of extra capacity with 3 lanes – it was originally planned for 2- as its unfeasible to add later. So its a terrible thing to allow for train future needs ? If these decisions are made by car users then simply emphasize the alternative is increased numbers of trucks on the motorway. As pointed out in the spinoff article yesterday, Cultural, Social & Environmental Effects has not been deemed worthy of it’s own algorithm, leaving it zeroed, when obviously increasing train capacity, especially if electrified, has high environmental benefits, passenger trains are potentially far more social than private cars and trucks, and sitting on the train you can read a book, thus upping your culture! So +++ for 3rd and 4th mains, making their case even less opposable. You really are a source of nuggets of wisdom. For years I have observed the use of loopy KPIs in large companies and the bizarre behaviour they engender in the Peter-principle managers. The KPIs are chosen, of course, because they are easy to measure. Great to know that there is a name for this batshit-crazy syndrome. But why would the minister be uncomfortable with revealing the best option is third and fourth rail lines? What is that all about? Putting donors ahead of sound policy? Or just a massive failure of imagination and courage from a government and a minister that simply cannot grasp the difference between managing transport in a large town like Tauranga and planning for the needs of a proper city? Sanctuary, if you are saying that he’s grasped managing transport in Tauranga I’d love to see some evidence of that. Yes. The vastly different approach to modelling for rail and road is an enormous flaw in the regional modelling process. The ART3 model is supposed to determine the “person-trips” expected at a time in the future, and the subsequent stages of the modelling process are supposed to then assign those trips to the network. By having an extensive, planned road network in the model and a limited rail network, of course those trips get assigned by the model to road, not rail. NZTA, get this sorted. You’re running an outdated model. You need to have a baseline that properly excludes all future infrastructure, and you need to run different scenarios including options such as an extensive rail network. Only then will you be able to show that induced demand on the (extra) roads will cancel any travel time improvements, or make them worse, and induced demand on the (extra) rail will reduce travel times due to improved services. I have created a new Petition for the 3rd and 4th Main. Will give that a good share around today to rally up some support. I am signing because these two upgrades are integral to unlock the true capacity of rail freight in Auckland. 1. Faster passenger trains with even spacings between trains rather than bunched coming at the same time meaning frequency not unlocked fully. 3. 100s of trucks off the roads each week including around the Waterfront which is one of Auckland’s best assets and likely to a focal point during Americas cup. But also less trucks on roads outside of Auckland also feeling the strain. 4. Allows Express/Intercity trains to work properly when if hopefully one day they are introduced. 5. It improves the economy. 6. It makes KR more profitable meaning fewer subsidies needed from taxpayers or more money that can be re-invested back into rail network. 7. Great for the environment. 8. It is value for money just 60m for a third main & 150-200m to build both a third & fourth main. That is chump change for such a transformative investment. Thanks Ben and Harriet. 18 signatures already – I think 200 should be possible but would love to see thousands of course! Probably needs a politician or celebrity or something to endorse it. Link it to Julie Anne Genter on facebook? Maybe Winston will pick it up too? Yes have added her onto the email list. Will see if she will share it on facebook. Have also sent it to NZF. I sent it to Transition Pt Chev and see already 3 comments by some of our members. Have also sent it to the people I know at Grey Lynn 2030, Bike Auckland and Generation Zero, so hopefully there’ll be support from those groups too. The thing about this issue, is that every wins. Business, freight, passengers, commuters, cyclists, pedestrians, drivers. Everyone except the road construction industry. over 100 supporters now. Going well. For F’s sake I cannot believe this is still ‘up for debate’ – construction should have started in anticipation of the electric trains. It did, which is why there’s completed 3rd main formation through Wiri that doesn’t have any track on it. KiwiRail had to stop the project when the other party they anticipated joint funding with chose not to proceed with the project. If it wasn’t for that it would have been completed in late 2012. It was started. In 2011. It just came to a grinding halt in 2012 for various reasons. Cheers Grant, it is now up to 386 signatures! This really puts in a blinding light this government’s ideological blindness on transport. It also seriously calls into question their credentials as a “fiscally responsible” government. This is obviously a project with such a high ROI that not doing it would really be a massive step back from the infrastructure progress we have been making. Perhaps the rationale for the redaction was the mis-spelling of manukau? Isn’t building a 4th main because we might need it someday and it ‘only’ costs $200 million the equivalent of building more lanes than needed on motorways because we might need it someday? Nothing wrong with building extra capacity on a motorway if it is likely to be used in the future, especially if it means not coming back at greater expense to add the capacity later. The Newmarket viaduct had capacity for three lanes well before the surrounding motorway had three lanes. You can argue of course the decision to have a motorway passing by the CBD but in the context of the motorway network it was a wise decision. The 4th main would be used from day one and will be vital in the future. But there’s everything wrong with doing so and not acknowledging the traffic it will induce. This traffic doesn’t just occur on the lane of the motorway, it affects a wide area. Agree. My point was that if you plan for growth it often makes sense to build the infrastructure in advance rather than having to constantly expand if you are certain it will be used. In the context of the motorway network a 3-lane Newmarket viaduct from the beginning was sensible. In the context of Auckland’s urban form it should never have been built. Agree, and your example was a good one to show that this future planning is done for road but not rail. It actually ‘only’ costs $100m, the marginal cost of building it compared to the third main. And yes, building key infrastructure that will be needed shortly is good planning. This is especially if you want that capacity to be taken up. As an example, my partner and I bought a fridge far bigger than the two of us need because we are planning to have children soon and didn’t really feel like buying two new fridges in 5 years. This is good financial planning, which is different to spending as little as possible. I would simply argue it’s the same. Build excess supply and you reduce cost/time/barrier to use, and increase demand. Basic economics right? The one key difference here is we don’t want to induce any more traffic on the road network, but I’m happy if we induce more freight on the rail system. Induced demand isn’t necessarily a bad thing, if it happens how and where you want it to. I must say that the withholding of information under the guise of commercial sensitivity has been found to be a complete lie. All that happened was the business case to expand rail corridor capacity was not only very sound but economically far superior to road options and flew in the face of National Party orthodoxy. That is not commercially sensitive. The cleansing light of day that the OIA is supposed to bring has shown the processes this government think by and I agree with the journalist who thought cronyism and or incompetence is a major player. And quite how Bridges thinks he is absolved of this is hilarious because surely the minister is THE one person who sets the standard! Yep, Kiwirail have been thrown under the bus here. There is no way they would not wanted to have released a business case shown that new rail tracks were a good idea. Perhaps the minister misread it and though that he could withhold the document to hide his comical sensitivity on this issue? 1) The Dig Once policy. Let’s do this now and not come back 10 years later when it will be more disruptive and costly to place down the 4th main given the 4th is on the eastern side of the existing lines where the Manukau spur starts. 2) Capacity: Both mains would be used by freight trains straight away keeping them off the other two mains for passenger services. If a train broke down in that area there is redundancy capacity to run around more effectively the dud unit than if there were three mains. Special thank you Harriet and the Greater Auckland team for getting this information into the public domain. Simon Bridges is a fool…….he has proven it many times. Don – if you say Simon Bridges is a fool, then he’ll get in a huff and not want to say yes. Far better to praise him for his forthcoming forethought and great intelligent powers to make a sensible business case for all New Zealanders, and especially those in his electorate, and even more so for the dairy farmers who are the backbone of this country, that this 3rd and 4th rail lines will prove highly advantageous to the rural community and for the good of the nation – and National voters. Go Mr Bridges, you happy, smiling, good looking, well endowed clever man! There, that should cover it. Well done Rt Hon Mr Bridges. You will be long remembered for instigating the construction, and completion of the third and fourth mains. The relief you have brought about to our motorways in Auckland. The removal of so many trucks is a huge credit to you. Not just that you have brought free flowing traffic on our motorways, but a massive reduction in carbon credits. A team player move, that will be well looked upon internationally. Well done good man. Its actually difficult to believe that here, in New Zealand, we actually have common sense winning out for once when it comes to transport. Now, perhaps,the pollies will get the 3rd/4th mains underway and cancel that EW roading abomination. WHat was the Transport Minister afraid ofin this business case? Sadly, I think the best chance of getting this built is actually if the EW link gets the big kibosh at the board of inquiry. The government will then have to support this project to be seen to be doing something for the freight industry. there is probably some dodgy deal with a large construction firm to build the EW link. As usual follow the money. $200 million is a “huge” cost? Come off it – it’s pocket change in the transport budget. What would the difference be for the timing of a Hamilton-Britomart service if it was express between, say, Puhunui, Newmarket and Britomart? How many minutes would that knock off? I think in Wellington running express saves about one minute per station. So you would probably save four minutes – one each for Papatoetoe, Middlemore, Otahahu and Penrose, after this it would start catching up with regular services as there are only two tracks from Westfield to Newmarket. Jezza it’s more than 1 minute – 1 minute is the dwell time at the station – you have to add on the time of slowing down and speeding back up again. Overall probably 3 minutes per station. Check out the Wellington timetable – it’s even less than one minute per station, the Hutt Valley express services save four minutes while skipping six stations. Agree there is more scope with our pathetic dwell times, but I am assuming they will be solved by the time Hamilton services begin! No way it is anywhere near three minutes though. You’d probably want to go via the Eastern so that you could still go express the whole way through. You would probably also stop at Otahuhu and Panmure. We currently do Puhinui to Britomart in about 35 minutes. By skipping six stops, we could save about 4 minutes, plus the couple of minutes that we save by removing a lot of conflicts. You would be under half an hour on that section. Extending the third main to Pukekohe would allow you to go express the whole way through. This should allow intercity journeys to take well under an hour to Pukekohe. Overall this should get the Hamilton to Britomart journey down close to 2 hours, even with intermediate stops. Agree – it will be third main to Pukekohe that will really unlock the potential for intercity services. I wouldn’t stop at Otahuhu, need to minimise stops on the express sections, people can catch a metro train from Puhinui. 2hrs still seems long for Hamilton, but I guess would be very fvourble compared to a drive or bus. Would do wonders for Pukekohe though to be linked wih Britomart in well under an hour. In good traffic, I can drive from my house in Swanson to my in-laws at Te Rapa in 1:45, but the last couple of trips on a Friday afternoon or Saturday have taken 2:30. Being able to go down on a train Friday night and return Sunday night with dinner on the train would be great. I believe a train service can be justified by more than merely saving time. I rarely get to the city centre in Auckland in less than 1h 30 from Hamilton and I only ever go in the late evenings. The drive is horrible as well, a train trip would be so much more enjoyable. I even catch the bus whenever I can so I don’t have to drive. When I think about it, 2hrs locked away on a train without any distractions would do wonders for my work productivity. Wifi or not. Why does the report have “NZTA” in the footer? Thought that NZTA had no jurisdiction over KR. Has the MOT finally seen sense here? It’s written on an NZTA template, it probably shouldn’t have been. Greater Auckland, Europe, United States, China, Japan and New Zealand, now try have a biggest fight to get all the money out from 25 Country: Brunei, Cambodia, East Timor, Indonesia, Laos, Malaysia, Burma, Philippines, Singapore, Thailand, Vietnam, Southeast Asia, South America, (Central America), Melanesia, Micronesia, Australia, South Asia, Western Asia, Central Asia, Africa, Hong Kong, Macau, Taiwan and Mexico into 5 Country: Europe, United States, China, Japan and New Zealand for every month. What? I have absolutely no idea what you are talking about. Plz explain. if we needed another reason for going with the 3rd (or 3rd and 4th) main over the motorway, it’s the fact that the extra money saved could be used to fund a proper solution for the closed state highway through the Manawatu Gorge – which is a situation where is actually makes sense to purl some real money into a road solution. The port of Tauranga is 3 times larger than the port of Auckland. It is growing faster than the POA because it has a deeper channel and accepts the new double the previous size super container ships. There is a 20% reduction in costs compared to smaller ships. The POA is losing out to POT and by restricting the flow to Tauranga where possible eg keeping a bottleneck and not building a 3rd line they reduce the decline in tonnage in Auckland. The NZ economy will be the poorer for it. Auckland council should sell the port now but keep the land. They could better use the money. I don’t think the rangitoto channel is 15.5m deep. There is the problem…. Isn’t it something like 12.5m? That prohibits the larger ships which can now berth at Tauranga. There has been plenty of media on both ports regarding all this. I have every confidence that that Bill English will come through on this one with his promise of -“Delivering for New Zealanders.” Unless he means spaghetti pizza? Its obvious the lines from Westfield to Wiri are like a country road carrying motorway traffic. With a road we don’t just tag an extra lane on we double or triple the lanes. As well as long distance trains not stopping at local stations there needs to be provision for the local services to have “fast” services with limited stops as well. A third line is a half pie solution, four tracks are needed, two fast lines and two slow in both directions. Station and bridge modifications are the fault of poor decisions some years ago similar to the Ak Harbour Bridge fiasco. I wonder what all the users of the freight trains travelling to and from the port of Tauranga and the port of Auckland think about the bottleneck. Do they support the E W connection as solving the congestion rather than a 3rd line. A $100 million for an extra line or $1500 million for a highway? It would be interesting to get the views of POT, Mainfreight, Fontera, and many other interested parties.They are always thinking about costs and their options. Kiwi rail shouldn’t be to blame if their wagons are increasingly held up in Westfield. Mainfreight has stated publicly – several times – that there needs to be a greater investment in rail by the government. I can’t understand that other businesses etc. don’t have their say about this very important issue. Mainfreight has won support with it’s comments. Surely it’s basic economics asking the questions and getting good answers and making the best decision and using the above table. Does the NZTA listen to the people? I strongly support transparency and democratic decisions. The goal of the NZTA is to get the priorities right in deciding which projects will give the most public good. Hey folks. Remember the adage, “Everything is delivered by road.” ? Well, you’re going to need the East-West Link , AND the four lines to Wiri. In the interests of measuring twice and digging once, I say get on and build all of it. Now.